Some days ago, I've noticed that the website had an weird appearance, the letters are very light-colored, the "quick links" have a color that is almost identical to the background (I can barely see them), the font has changed, etc. Is this a bug? For me it looks like the website is broken or something. I've waited a few days before posting because you could be updating something and this broken appearance could be temporary. 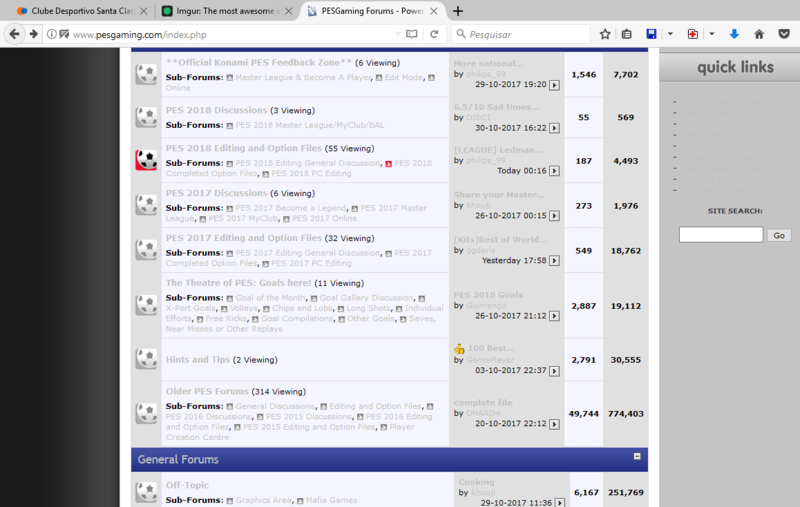 For now, I've changed to the theme 'PESGaming (Wide)', but I still prefer the appearance of the 'PESGaming' (default) theme, is there any chance that it will be fixed? P.S. I am using Mozilla Firefox but I already tried Microsoft Edge and it is also broken in there. It's the same thing for me , on Firefox and Microsoft Edge too. Can you correct it please ? The colors are already fixed, now I can see everything clear, but the font is still weird. It's smaller and it looks like all the letters are bold. Could you fix it?